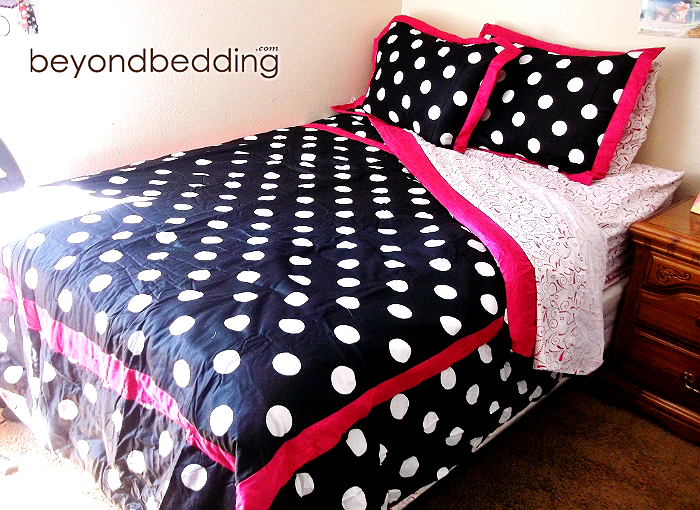 *** BeyondBedding.com provided a 3PC Sweet Jojo Designs bedding set for the purpose of this review. 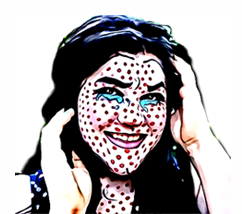 No further compensation was provided; the following contest is hosted by the sponsor. 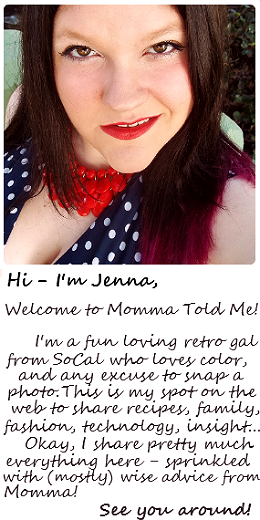 All photos within are copyright Momma Told Me Blog 2013. Momma Told Me: Go to your room! 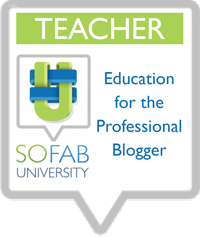 Over the past month there's been plenty of talk about 'back-to-school' shopping in the Blogosphere. It seems, every year, kids needs new stuff- annoying, right? When I was a child I outgrew everything so fast Momma quickly instituted a second hand rule that capped my 'shopping' at 80% up-cycled, and 20% new clothing, each year. I recall, in my household, there were never arguments over what would or wouldn't be bought. Oh, Momma had her say alright- and made it amply clear that, if she were paying, I was wearing whatever she decided. 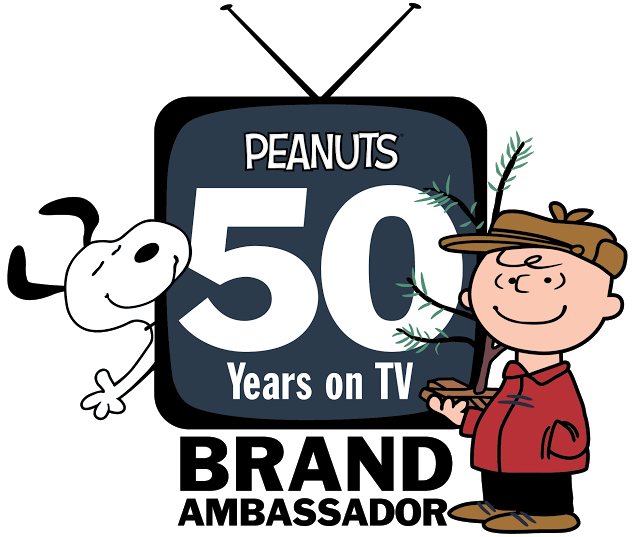 And, since my birthday fell at the end of August, often my only hope for some self expression was a department store gift card here and there. There was, however, one 'back-to-school' item, I did get to splurge on each year; bedding. Living out here in Southern California, we enjoy Summer temperatures right through most of the Fall. Just the past week our average highs touched 90F, and the overnight lows didn't dare drop below 60F. Since Sabrina (10) has a glut of character blankets she loves to snuggle under, we decided it would be nice to lighten her bedding with a new comforter, and matching shams. Of course, her Momma was not interested in spending another $200+ on a bedroom renovation, so we all headed online to check out Beyond-Bedding.com, which presented a wide range of modern bedding for toddlers to adults. We immediately fell in love with several of the styles within the Teen bedding (Full/Queen) collection, and Sabrina had a hard time choosing between her 3 favorites. Beyond Bedding offers kid's bedding with a signature brand known as Sweet Jojo Designs, that offers bold colors and prints in fun and fashionable bedding that will easily grow with your child. While we ended up with the 3PC Hot Dot Modern Teen Bedding, Black and White Funky Zebra and Black and White Isabella proved beautiful alternatives during the search. 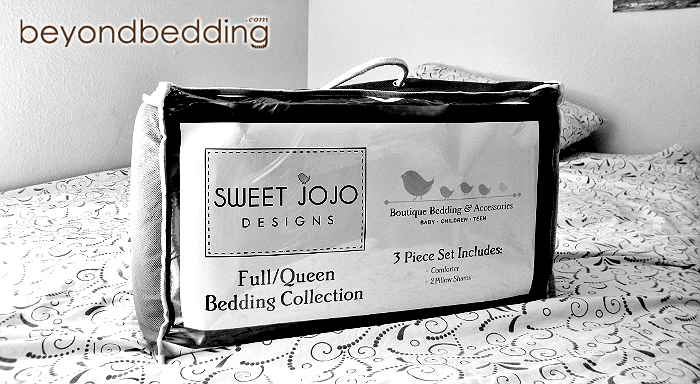 When our Sweet Jojo bedding arrived it was neatly folded in a compact zipper back, great for seasonal storage, and we found 2 Jumbo pillow shams folded neatly inside our comforter. At first I was a little hesitant of the thickness of the comforter, which seemed very light upon first inspection. I quickly realized this would prove an asset as we transitioned through the last of our warmer months, and would even be easier for Sabrina to handle when making her own bed. Naturally, what mattered most was what Sabrina (10) thought, after all, it was going to be on her bed for quite a while. Between you and me, I think some of her initial enthusiasm was seeing her bed made "fancy like in a hotel," which is simply her way of saying, well, made. When we were all done dressing the bed she stood back, her hands on her hips, and declared; "Wow! It looks like a whole new bed, but it isn't. We just changed the top!" As it turns out the Sweet Jojo design we'd chosen matched her sheets beautifully in color and print, and the pops of bright pink even play well with her stuffed penguin collection and eclectic taste in throw pillows. I'd also certainly recommend shopping online, with Beyond Bedding toddler bedding for any upcoming baby showers or first birthdays; there are some truly gorgeous bedding sets at amazing prices. 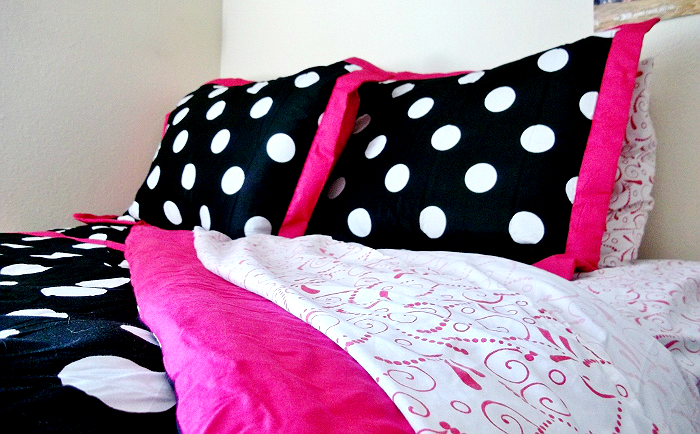 What Daughter Says: Help your child express themselves with affordable bedding that really fits their style. 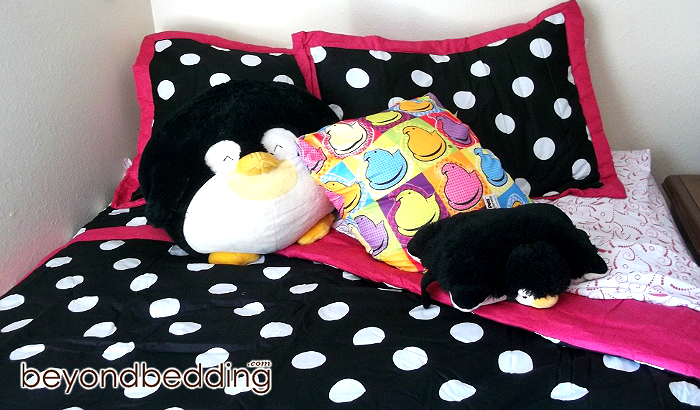 Beyond-Bedding is offering our readers a chance at 1 of 5 complete Sweet-Jojo Designs bedding sets for toddlers or teens. Enter below! It looks so bright and happy. I love the hot pink - one of my favorite colors. There is nothing like a pretty comforter to brighten up a room and make it feel brand new! Oh my gosh it's so cute! What a great pattern and I love the colors!! Your daughter looks so cute snuggling that pillow on her gorgeous new bedset! Her smile is contagious!! It just made me smile! 4 pc Twin Set. It would be perfect for my daughters new twin bed. I like the Monkey and also the Jungle time bedding sets. That is cute. We always get the kids new bedding each summer. The comforter you picked is adorable! I need new bedding! LOVE LOVE LOVE that comforter set so cute! The bedding looks good for the kids. They are comfortable and soft. But, I have one question. Does it offer any warranty? Is it allergy free and machine-washable?